This is a photograph of Lida Ann Beaty Pearce Jackson who was born November 19, 1881, in Tipton, Indiana. She lived there until 10 months of age when her parents, David and Jemima Beaty decided to go west to Kansas. The Beaty family stopped first in Linn County, just across the Missouri border, and stayed about a year with relatives, then moved onto Stafford until March 1885 when they set out to stake their claim. They settled in Hodgeman County between Jetmore and Kalvesta (10 miles from Jetmore / 6 miles from Kalvesta), not far from the Pawnee River, a few miles south from the Santa Fe Trail and 30 miles northeast of Dodge City. The Beaty family stayed for seven years until drought and wind forced them to leave. The family went to Osawatomie where Lida met and married Herbert Pearce, a newspaperman, in 1904. They had two daughters, Margaret and Josephine. Herbert died in 1907, and Lida moved with her daughters to Irvington, Indiana. Lida met Ed Jackson, her neighbor, in Irvington, Indiana, and they married in 1920; he was 47, she was 39. 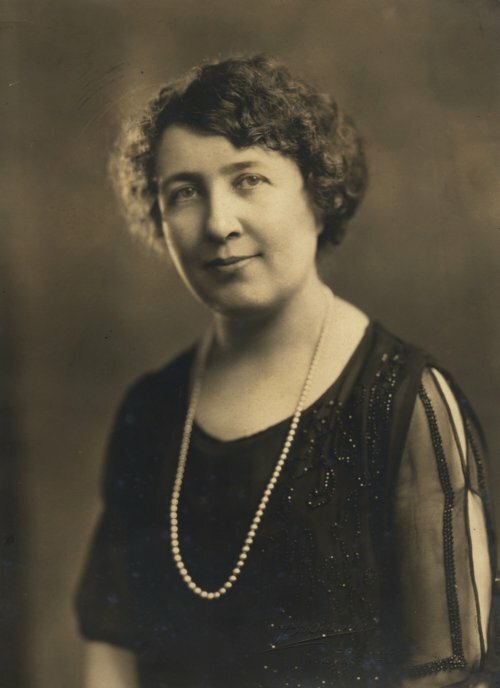 In 1924, Ed Jackson, an attorney, was elected and served four years as governor of Indiana, and she came to be known as Lady Jackson. She was a national leader in children's work for the Christian Church, as well an active worker for preserving historical sites and conservation in Indiana. In 1937, the couple moved to Orleans in southern Indiana, where Lida had a little antique shop and a collection of world dolls for which she fashioned clothes inspired by pictures from her beloved National Geographic. Most of the collection was donated to the James Whitcomb Riley Children's Hospital in Indianapolis. Lida Ann Beaty Pearce Jackson died in April 1956. This is a photograph of Lida Ann Beaty Pearce Jackson who was born November 19, 1881, in Tipton, Indiana. She lived there until 10 months of age when her parents, David and Jemima Beaty decided to go west to Kansas. The Beaty family stopped first in Linn County, just across the Missouri border, and stayed about a year with relatives, then moved onto Stafford until March 1885 when they set out to stake their claim. They settled in Hodgeman County between Jetmore and Kalvesta (10 miles from Jetmore / 6 miles from Kalvesta), not far from the Pawnee River, a few miles south from the Santa Fe Trail and 30 miles northeast of Dodge City. The Beaty family stayed for seven years until drought and wind forced them to leave. The family went to Osawatomie where Lida met and married Herbert Pearce, a newspaperman, in 1904. They had two daughters, Margaret and Josephine. Herbert died in 1907, and Lida moved with her daughters to Irvington, Indiana. Lida met Ed Jackson, her neighbor, in Irvington, Indiana, and they married in 1920; he was 47, she was 39. In 1924, Ed Jackson, an attorney, was elected and served four years as governor of Indiana, and she came to be known as Lady Jackson. She was a national leader in children's work for the Christian Church, as well an active worker for preserving historical sites and conservation in Indiana. In 1937, the couple moved to Orleans in southern Indiana, where Lida had a little antique shop and a collection of world dolls for which she fashioned clothes inspired by pictures from her beloved National Geographic. Most of the collection was donated to the James Whitcomb Riley Children's Hospital in Indianapolis. Lida Ann Beaty Pearce Jackson died in April 1956.